hand engraved and created jewelry for the most respected stores in Louisville and the surrounding areas. In 1973, Mr. Moore decided to open a retail store which featured the shop as an integral part of its operations which started a trend in the industry. 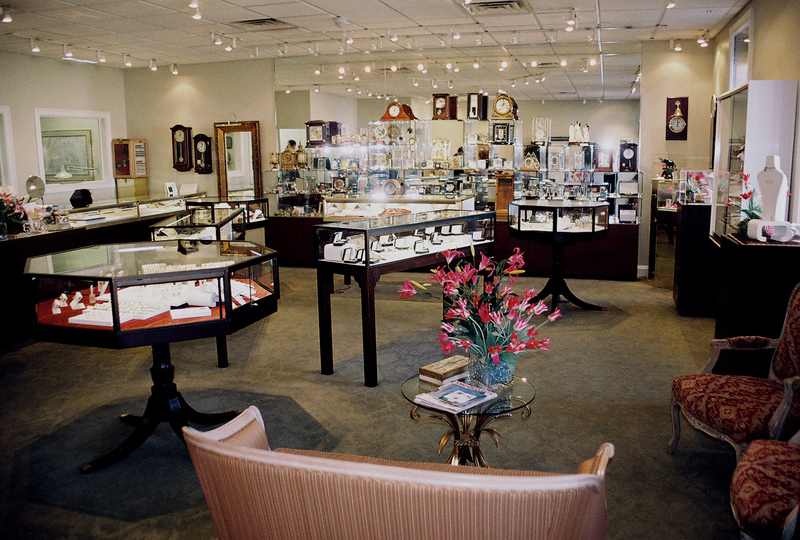 Upon his death in 1987, John W. Moore Jewelers in downtown Louisville was passed to his widow and has since closed. Tim Moore was apprenticed in the “old school” tradition by working at his father’s side from the age of 14. By the time of Mr. Moore’s passing, Tim was responsible for most of the work accomplished in the shop. He and his brother John Moore laid the plans for Moore Jewelry as soon as it became apparent that their offer to buy their father’s business was rejected. Tim opened the store in the fall of 1987 and his brother John joined the business in the spring of 1988. The tiny 440 square foot store soon became too small to accommodate the old and new customers who liked the “Moore Brothers” knowledgeable service as well as their commitment to their father’s traditions. They moved around the corner into a larger space but this location still lacked the visibility and access they wanted. In 2002 they were presented with the opportunity to move to their current location on Highway 42. With its proximity to the “Starbucks” operation this new store provided an easily identified spot and additional exposure. The new location with its living room layout has a comfortable and welcoming atmosphere. Serving all their customers’ needs and providing the best quality in both services and repairs is a tradition both Tim and John Moore work hard to maintain. The entire staff at Moore Jewelry is committed to retaining the highest level of personal attention and treating customer’s like friends that most become. The reputation and reliability enjoyed by Moore Jewelry is a tradition going back to the basic concerns John W. Moore, Sr. emphasized when he embarked the family on its journey to establish a jewelry store "for the particular." Tim Moore joined his fathers trade shop, John W. Moore Jewelers in Downtown Louisville at the age of 14. He apprenticed under his father learning the traditional methods of jewelry repair and design. After 45 years plus in the jewelry industry Tim upholds the same principles of quality workmanship that his father instilled in him many years ago. John Moore, Jr. loves working with people; coupled with a banking background, he joined his brother to round out the business side of Moore Jewelry. His desire to serve the clientele also proves to be an invaluable contribution to the success of Moore Jewelry. Jennifer Metry Hieb, Moore Jewelry is fortunate to have Jennifer who provides informed quality assistance to customers. Her background in this specialized industry as well as her enthusiasm for jewelry is a true asset to the company. She strives to create a comfortable pressure free atmosphere for all customers. Tim Holbert, an expert bench man, has been with Moore Jewelry for over 20 years. He lends his skill and abilities to making certain that each repair is thoroughly and appropriately accomplished maintaining the integrity of each item. Paul Thomas brings almost 40 years of expert watch repair skills to the store. Paul is a graduate of Gem City College, a watch and jewelry repair school. He works on anything from vintage wrist and pocket watches to new quartz watches. He is also trained and certified by Rolex to provide expert service to Rolex watches, using only genuine Rolex parts. Paul provides in house service to Moore Jewelry's customers and also handles watch repairs from other stores in the region. We are very fortunate for our loyal staff whose integrity and skills contribute to the continued success of Moore Jewelry.